I know I just posted about prayer, but I wanted to share two big things that have happened during the last week. 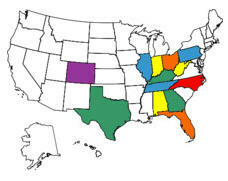 I’ve added several states based on your feedback on here and facebook. We know of people in 25 states praying for our boys. This map gives me chills. In what might be one of the kindest and most empowering gestures I’ve ever seen, my coworkers put together a prayer calendar. Listed on that calendar, starting on August 22nd and for each day afterward, are the names of people who have offered to pray for us on each particular day. In presenting it to me, a group gathered around on a work day morning, and talked of a recent excerpt heard on KLove. How if Joshua had stopped after 6 times, the walls of Jericho would not have fallen. If Naaman had bathed in the river only 6 times, he would not have been healed. In both instances, persistence, patience, and faith were required. Then right there, in the midst of our computers, spreadsheets, and filing cabinets, my supervisor led the prayer for August 22nd. We have a lot of unanswered questions rolling through our heads, but J and I have talked a lot and know without a doubt why God chose this timing. This town, these coworkers, these friends, this church, this support group (both near and far)…YOU were the ones we would need. Many of you have commented or emailed about prayer. About its power, about how actively you are praying, but also that you aren’t sure what to pray for at times. Peace as we go through this. Peace for us, for the boys, for our families. The right medical team to guide us, especially as we make tough decisions. The ability to trust God, and find comfort and understanding in His will, even if it is not our own. That something good will come of this…that the pain and heartache will not be in vain. That last one is the one I get stuck on. It’s what my heart really wants. And He knows it. We continue to be overwhelmed by the amount of people letting us know about their diligent prayers for our little family. Every facebook message, email, text, phone call, or other note means so very much. We are so thankful for that, and I think YOU are helping me find peace and comfort in this…even though for now, I’m often stuck on prayers for healing. I thought it might be nice to take note of all the prayers that are going up for Landon and Nolan. Here’s a look at the states that I know of. 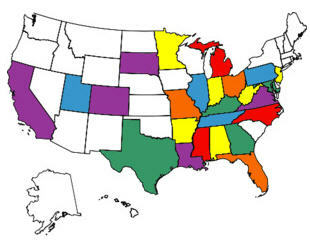 If you are praying from a state I haven’t highlighted, let me know! In the meantime, please keep praying, feel free to share our story and feel free to let your church, family, friends, etc know. In case you missed it in a comment on another post, there’s a sweet little four-year old boy in WV who has no clue who we are, but who is praying “for the baby twins who are sick in someone’s belly”. I was told yesterday there was a church here in town (not even ours) where the pastor mentioned our family, only to realize the rest of the church had heard about us and was already praying as well. Thinking of these things makes me smile. God is hearing about Landon and Nolan from far and wide. So you are part of our large and growing prayer team, no matter where you are. Please keep going! There’s one more thing that I’ve been praying for. That God would bless all those who have taken part in this story. That those who are caring, praying, and hoping for the best could realize how much they have already blessed us, and that God would help us return the favor.